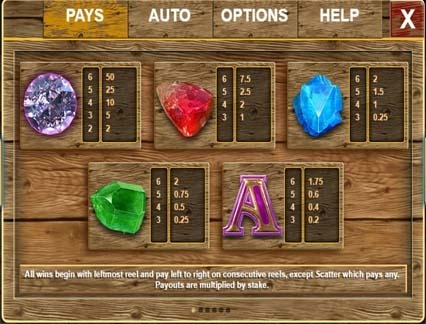 Game Information: Bonanza is a powerful, unique and exciting pokie machine from Big Time Gaming. The game was first released in December 2016. The game is based on the Megaways game engine and you will realize that you are in for some serious ride from the start of the play. It has 117 649 pay-lines which alone tells you that this is indeed a pokie that you must try. There is so much also that the game has to offer. Bonanza features six reels and on each reel 2-7 symbols may appear as a result of the Megaways game engine. You can read this review to understand why this is an amazing game that you must try. When you start playing the game, you should be on the lookout for Rubbies, Diamonds, emeralds and sapphires as well as Golden Bars. These symbols trigger the Free Spins feature that comes with expanding multipliers. The winning symbols will explode and will be replaced by the new ones for numerous winning combinations. Bonanza is a visually impressive game that is playable from 0.20 coins per spin. The wild symbol in the Bonanza pokie is represented by a pack of burning red dynamite vector. The wild replaces all other symbols except the scatter symbol. The scatter is symbolized by Gold bars with the letters G, O ,L, D carved on them. If you land on any four of these symbols on any space on the reels during the base game triggers the free spins round where you get to enjoy up to 12 free spins. Just as its name, the Bonanza pokie is set amidst a gold mine surrounded by heavy vegetation in a forest. The game has a small waterfall to the right side of the screen and a small cottage to the left that makes the game aesthetically appealing. The reels resemble rocks or stone boulders and with each spin the cart moves a train track making it have the Stone Age era appearance. The background is similar to the sound of a banjo and giving the game a playful feel. Overall, this Big Tome Gaming Title has an appealing 3D graphics, quality sound effects and a look that is in total sync with the gold mine backdrop. 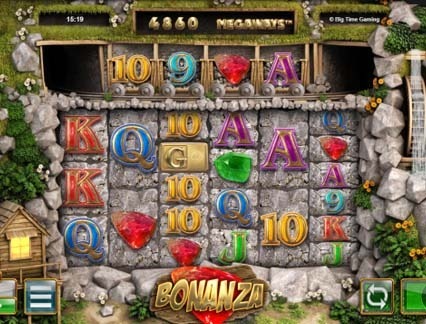 Bonanza features 6 reels and benefits greatly from the Megaway game engine. This great online pokie pays left to right; starting from the leftmost reels and 3 similar symbols is the minimum requirement for landing payouts. Apart from the six reels, there is the horizontal reel that comes in and out from the mine on charts. 4 charts appear with four extra winning symbols that can all be added to the winning combos to the reels directly below them. All winning symbols will explode allowing space for new symbols to appear, creating the chance for additional wins within the same spin. Before you can start mining, you should set the most appropriate bet of between 0.20 and 10. Bonanza Pokie is available to play on mobile devices, and this is certainly a game that is worth having in your pocket. It can be played on Android, iPhone, iPad or any other mobile device. You can also access it on Windows and Blackberry. Bonanza is simply a great pokie compatible in handheld devices and you can be assured of a lot of fun wherever you take it. 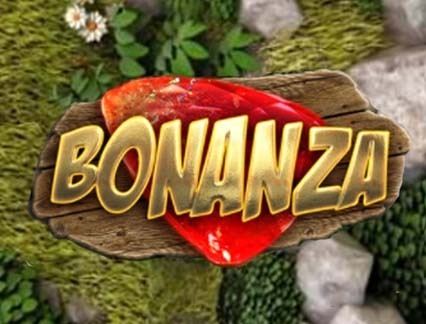 There is only one special feature included in the Bonanza game; the Free Spins. To trigger free spins, you must land on at least Four Golden Scatters on the reels. These will earn you a total of 12 free spins while every additional Golden Bar appearing rewards you with five extra free spins. When the free spins begin, they trigger the Unlimited Win Multipliers. It starts at 1x, but this will increase with 1x with each reaction. With this feature, you have the chance of winning big as long as you can create longer reaction of winning combos. The free spin can be reactivated using the free Spins Scatters. The scatters will appear only on the charts and a minimum of three will be needed to re-trigger the feature. With 3Free Spins Scatters you get 5 free spins, while four Scatters reward you with 10 free spins.